Everyone here at Southgate & Culham pride themselves on providing good customer service. Our customers are very important to us and we believe that everyone deserves a professional and friendly service. We put our customers first and continue to seek new opportunities to aid them wherever possible. The latest of this being our recent 0% finance options. We have put a selection of finance options together to help make boiler installations more affordable for all. You can find out more about our finance packages here. Our team of trained engineers have a wealth of knowledge and experience in the boiler and plumbing industry, helping us to solve our client’s problems quickly and safely. 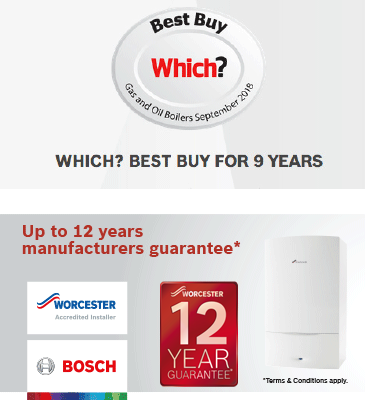 We are also Worcester accredited and so can install Worcester boilers to the highest of standards. We provide a range of services to suit all needs, view our site to find out more or simply get in touch! Our engineers are Worcester Accredited, which means they have completed the necessary training to be able to install Worcester Bosch boilers to excellent standards. Worcester runs this programme to help identify domestic and commercial heating companies that offer sustained quality of installation, service, and customer care. We're proud to have achieved this accreditation and pleased to be able to offer exceptional installation standards to our customers. On time, no fuss, very clean and tidy. A very good job all round explained. Heating controls very well. A very professional job all round. Top marks. We found Southgate & Culham to be a great company. Really friendly, trustworthy team, with a positive attitude, and did the job thoroughly and quickly. I would definitely recommend them. I was very pleased with our boiler installation. The men were professional and courteous. They cracked on and finished early. Very little disruption or mess. Highly recommend this company. We provide quality heating and plumbing services to customers across Suffolk.